Die casting is the process of forcing molten metal under high pressure into mold cavities (which are machined into dies). Most die castings are made from nonferrous metals, specifically zinc, copper, aluminum, magnesium, lead, and tin based alloys, but ferrous metal die castings are possible. The die casting method is especially suited for applications where a large quantity of small to medium sized parts are needed with good detail, a fine surface quality and dimensional consistency. 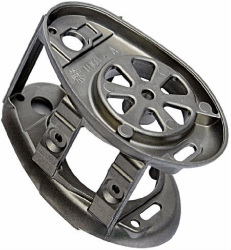 This level of versatility has placed die castings among the highest volume products made in the metalworking industry. Die casting continues to play a critical role in the success of U.S. manufacturing through the production of the high quality castings. In fact, castings are used in 90% of all finished manufactured products. As an important segment of the larger metal casting industry, die casting produces over one-third of all metal castings. Today, die casters manufacture thousands of non-ferrous castings: from automobile engine and transmission parts; to intricate components for computers and medical devices; or a desk stapler. Die casters contribute over $7.3 billion to the nation’s economy annually and provide over 63,000 jobs directly and indirectly. The die casting industry is a microcosm of American business. 58% of these companies have fewer than 100 employees, while our larger firms are world leaders. To meet the challenges posed by today’s global marketplace, the North American die casting industry is leading the rest of the world with new technology, higher productivity, innovative applications and superior quality.